You know, I’m not one of those people who feel very often that a message from the pulpit or from a speaker goes right to my own heart or life situation. But this past Sunday, when my own husband Michael taught a lesson on David and Goliath, it was as if everyone else in the class of 50 or so folk disappeared and what he was saying, he was saying only to me. During the week, while he was preparing and studying, he commented to me that everyone there has heard about this particular Bible story a thousand times or more. This is a group of people well-versed in scripture for the most part, so he was looking for a new angle, something that would capture the essence of what was happening in the life of David that would be different from what we’re used to when we hear sermons and talks about the giant who kept threatening the army of Israel for 40 days. So he went back to the exodus of Israel from Egypt, citing it as the most mentioned event in the Old Testament – and often mentioned in the New Testament as well. Moses leading the people from Egypt, through the Red Sea, and into the desert, where they spent 40 years wandering around until Joshua and Caleb led them into the promised land. Who hasn’t heard that story, and who hasn’t thrilled to the meaning and significance to every believer alive today? And here’s how he tied it to the David and Goliath story: when the Israelite army faced the Philistine army in 1 Samuel 17, King Saul forgot several things: he forgot to bring the priests with him to the battlefield. And he forgot to put away his fear. He forgot Deuteronomy 20. Every day, twice a day, Goliath would come out and taunt the Israelite army, and nothing would happen except that the Israelites would grow more fearful. There was no battle. There was only this daily taunting by Goliath, morning and night. When David came upon the scene to bring food to his brothers in the army, he was dismayed to see what was going on. He immediately understood the reality of the situation: it was not the Israelite army that Goliath was harassing and taunting, it was God. “Who is this uncircumcised Philistine, that he should taunt the armies of the living God?” David asks (1 Samuel 17:26), in one of my favorite Bible verses, and so he volunteers to fight the giant Goliath. Saul outfits him in his armor. David is awkward and uncomfortable. It is not what he is used to. He takes Saul’s armor off and gets back into his own comfortable shepherd clothing. 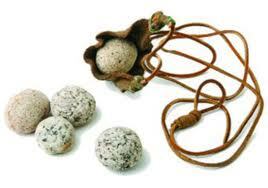 He goes to the river and picks up five smooth stones for his slingshot, but he only needs one. He fires, hits Goliath, who was probably standing there laughing at this pipsqueak facing him, and causes the giant to tumble face first into the mud. Then, he takes Goliath’s sword and cuts off his head. The most unseemly way for a man in that culture to die was by his own sword. Such was Goliath’s defeat, utter and complete. The uncircumcised Philistine was done in by a slingshot and a stone and the unwavering faith of a shepherd boy, with the mighty Israelite army standing by and watching. Well, for me at this particular time in my life and the particular situation I’m dealing with, it couldn’t have been more appropriate and more timely. I don’t think Michael was even aware of how much what he was saying meant to me. It wasn’t until later that day that I told him. He was very flattered. And it wasn’t until the next day, and the next, as I told him how much the story of David and Goliath and the message of “Fear not!” continued and continues to resonate with me that I realized that this message was exactly what I needed in such a profound way. So today I say to you: “Fear not.” Let God go before you, make sure you understand that the battle you’re fighting is God’s, not yours, and because of that truth, put Him at the very front of the battle. Let Him lead the army. Go back and read Deuteronomy 20, savor it, think about what it is saying to you in your situation in 2012. In other words, be your own priest and go before your enemies to strike fear in their hearts because of your courage knowing that you understand the spiritual aspect of the battle you are fighting. It’s only then that the Goliaths in our life can be taken down and destroyed, when we realize that they are actually taunting the living God. I absolutely loved this!! Thank you!